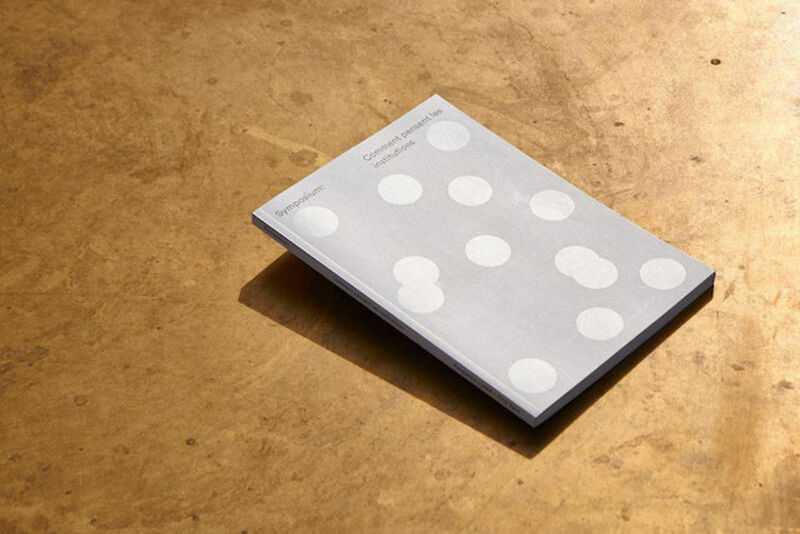 London-based design studio Julia have built a formidable reputation in recent years for their thoughtful, conceptually astute work for cultural institutions all over the world. 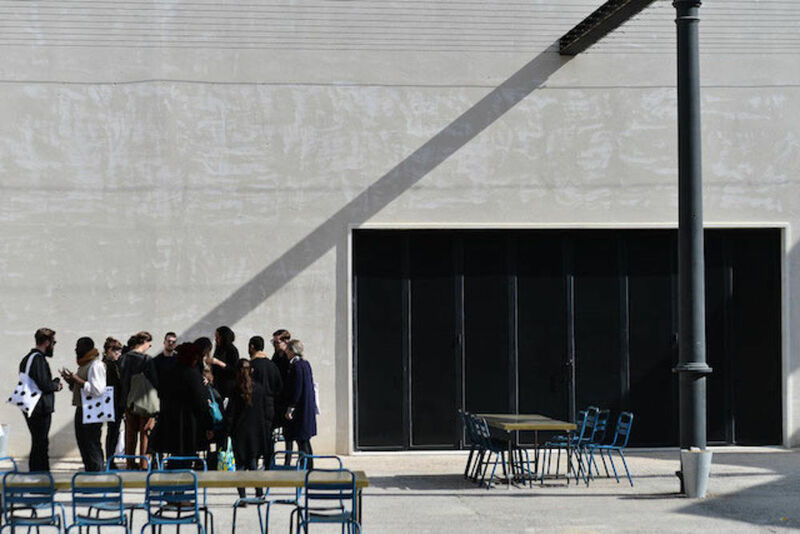 The studio, founded by Valerio Di Lucente, Erwan Lhuissier and Hugo Timm in 2008, is adept at walking the fine line that these clients and projects often demand: between direct representation and allusion, complexity and simplicity, flamboyance and restraint. How did this project come about, and what was the brief? 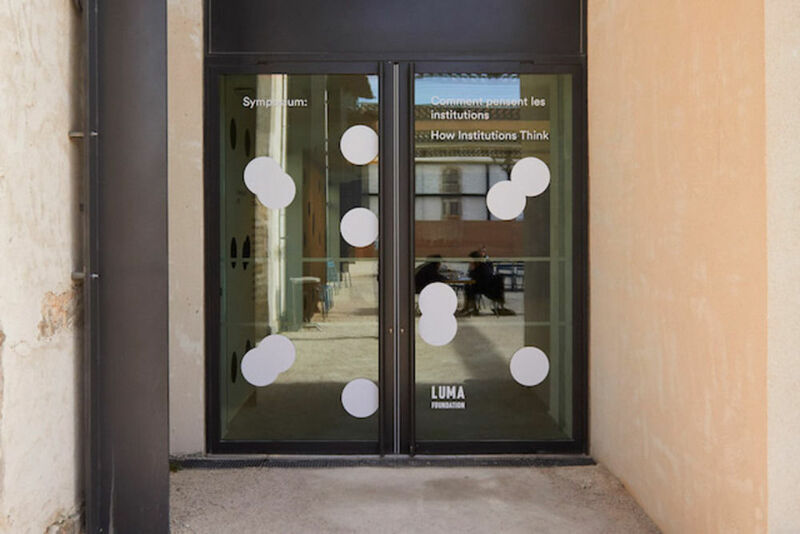 In October 2015 we were approached by Paul O'Neill, the director at the time of the graduate program at CCS Bard, to design the identity for an upcoming symposium at LUMA Arles in February 2016. 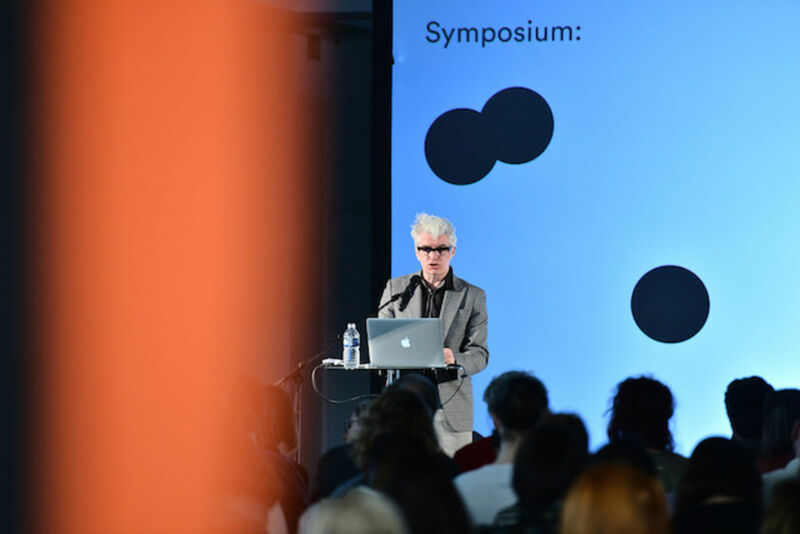 The symposium, which took its title from Mary Douglas’s 1986 book How Institutions Think, addressed the contemporary possibilities and limitations of institutional formats and practices, but starting from a different place; namely from categories of knowledge, cognition and the social. 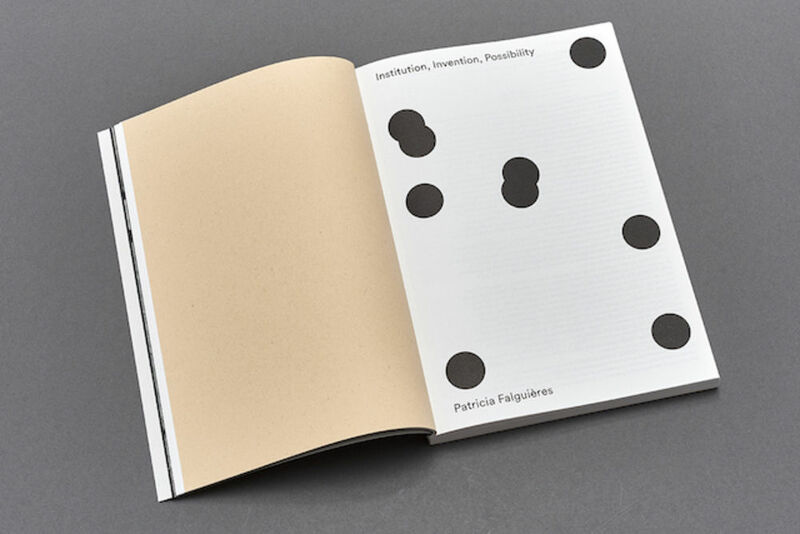 We were asked to create an identity which would encompass a variety of applications, and to design a book which would be published at a later stage, as a result of the discussions held in Arles. How did your working relationship with CCS Bard and Luma Arles develop? Paul O’Neill was our main point of contact on the creative side, but Tom Eccles and everybody else at CCS Bard were in the loop, which in turn mediated with LUMA and the numerous institutions which took part in the project. In some ways, considering Mary Douglas’s proposition, it seemed a pertinent scenario: representatives of diverse institutions reflecting on the questions she posed. Regarding the design, we are firmly opposed to a ‘decision by committee’ method. On this occasion the relationship could be described as pyramidal – we dealt with the top of it, making a complex set of decisions extremely easy. It seemed natural to start our work on the identity with an exploration of the ideas within Mary Douglas’ book, but the challenge for us was how to translate such abstract ideas into graphic form. Within the title lies an implicit paradox, as institutions aren’t thinking beings, but as Douglas argues in the book, concepts and ideas are collective representations. In one passage within her text, institutions are described as macro expressions of an individual intellect which, by analogy, groups itself with others in order to create a system of values. With this notion in mind, it was necessary within the design for us to first consider how we might represent the individual, before representing a collective. 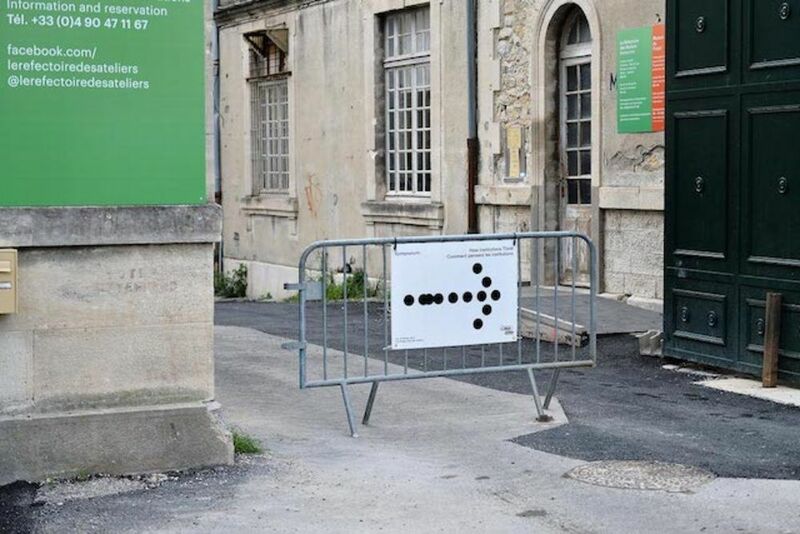 We expressed this in its most basic form: a black dot. This primitive symbol became the foundation of the identity, which we used to illustrate possible institutions, representing ideas of social structure, hierarchy, order vs. chaos, left vs. right, and majority vs. minority. Each application of the identity would present an arrangement, to be read as a poetic attempt rather than a descriptive effort. Ultimately our aim was to create a conceptual atmosphere which would surround the symposium. 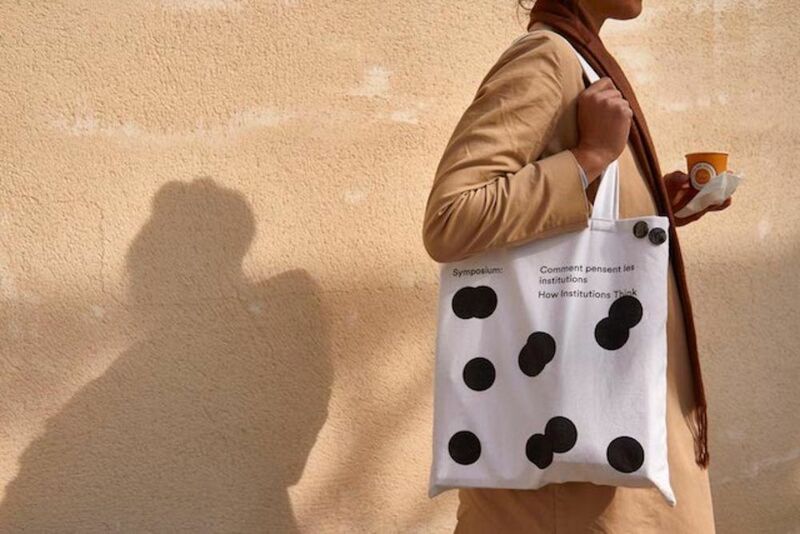 In regard to typography, we used a geometric sans serif that went hand in hand with the dots, combined with a black and white colour scheme to keep it pure. Lastly, the arrangements always have dots overlapping each other – this was to convey a sense of structure in motion, never fully formed, but also as a metaphor for beings ‘less willing to conform’. The end result was almost ‘psychological’; visitors drew multiple interpretations from the design and reacted in different ways to the identity, which made us very happy and felt in keeping with the premise of the symposium. Tell us about the book's production—how has it been made, and what influenced your choice of materials and processes? 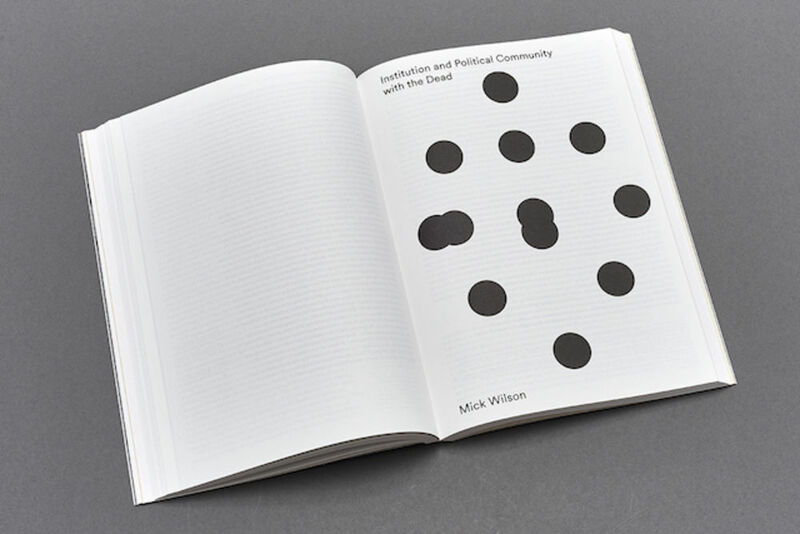 After the symposium, we were asked to design a follow-up book published by CCS Bard, LUMA and MIT press. This publication acted as a culmination of the discussions held in Arles, along with some new contributions that offered new perspectives. 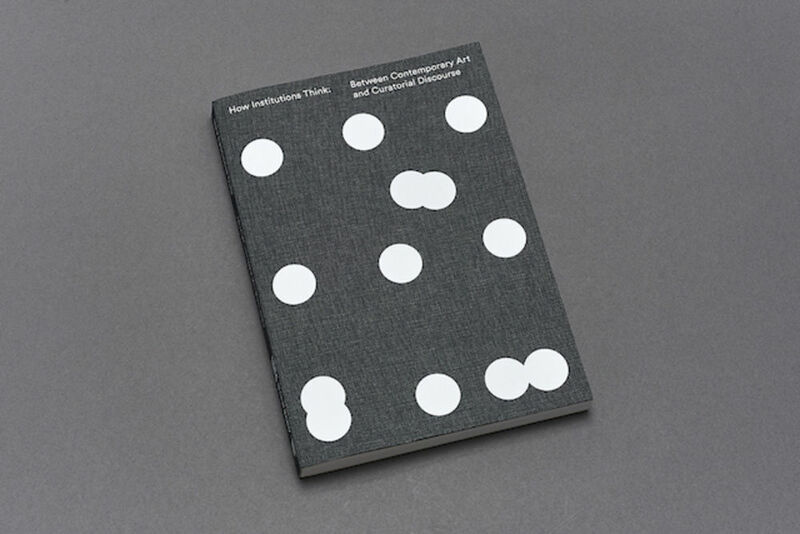 Structured as a series of essays, the book was softly divided in two chapters, plus a reproduction of an artwork specifically created for the symposium by artist Céline Condorelli. To begin we decided upon an A4 format for the book. It seemed appropriate to start from a standard format used by almost every country in the world – apart from American influenced countries – and in some ways it represents the epitome of an institutionalised sheet of paper. 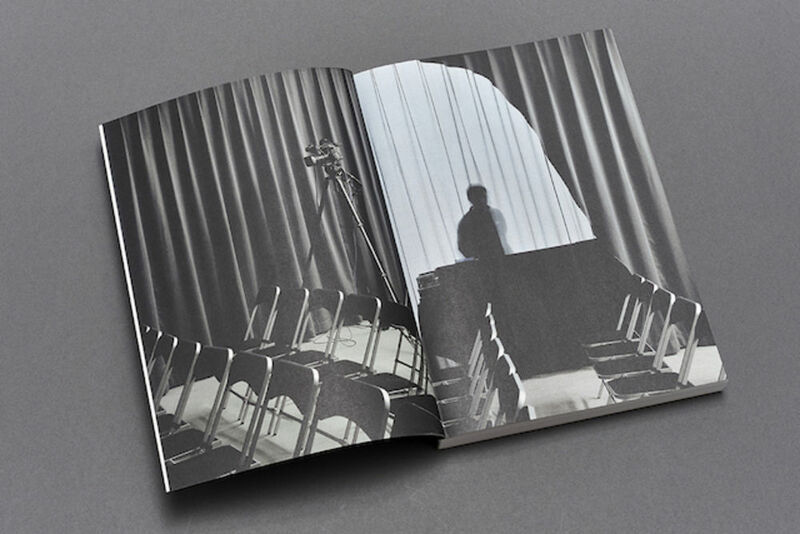 The design expands on the symposium identity, whereby the book is built on a grid displaying different ‘constructs’. 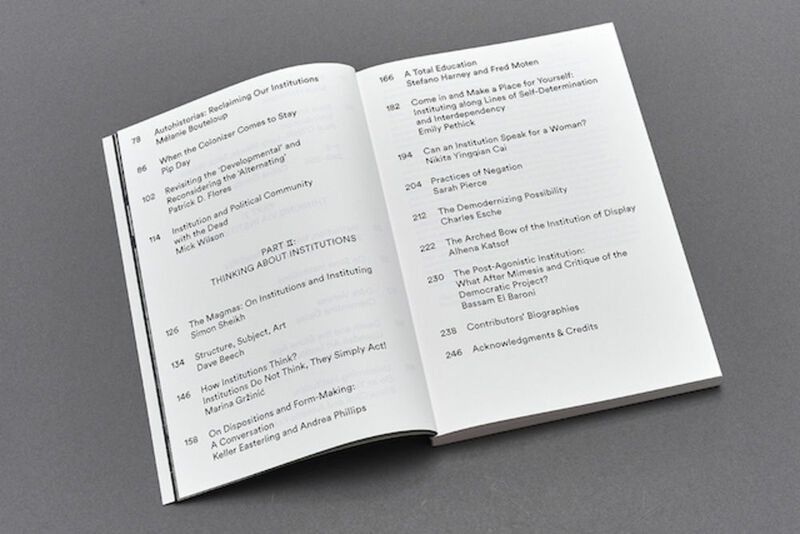 The essays’ layout changes throughout book, from one to two columns, from side-notes to footnotes. This variety reinforces the idea of a breadth of positions, rather than fixed conclusions. This design approach also allowed to better represent the tone and typology of the contributions. A longer column for deeper reads, a two-column system for more ‘narrative’ essays, and alternating widths for conversations. 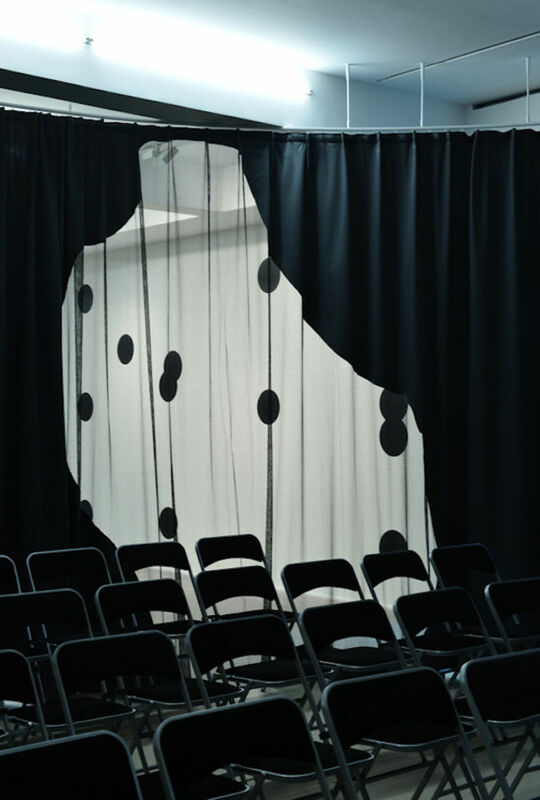 Céline’s piece, All Our Tomorrows, was installed in Arles as a curtain, creating a room within the symposium’s main room. 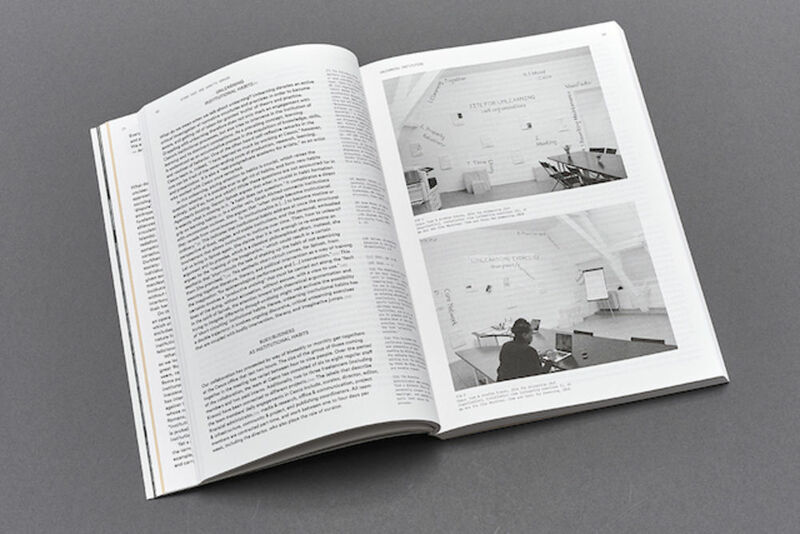 We translated this within the design into a photographic essay on the very first and last pages of the book, surrounding the debate. Lastly, as an object, the book plays on expectations of authority: The cover feels official through the use of cloth, but it’s glued onto a more informal softcover. 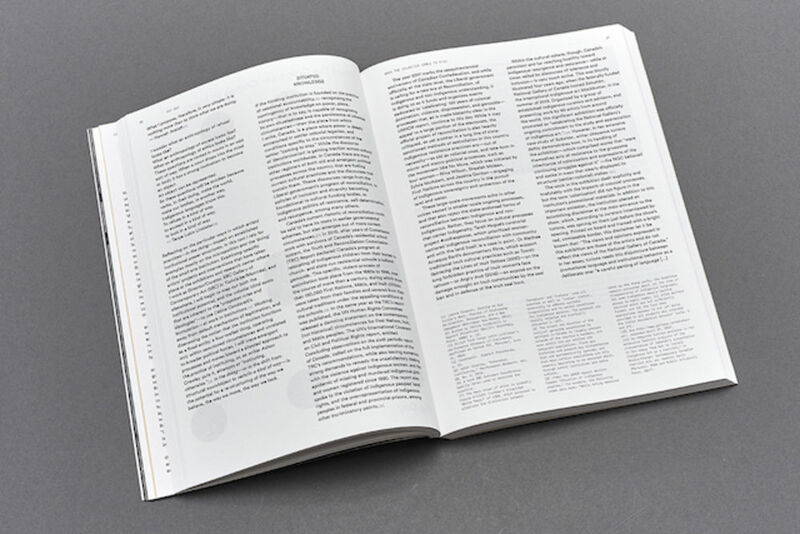 The format is large, but light in weight due to the use of bulky book wove paper. 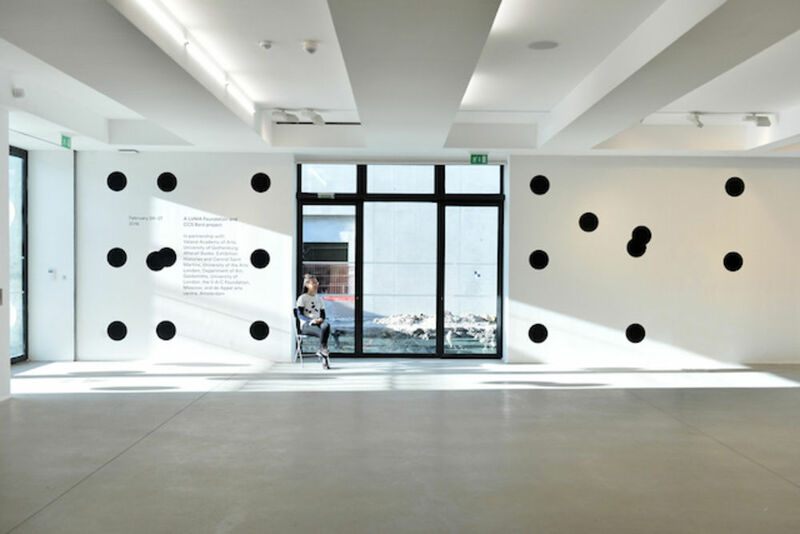 There are more books and exhibitions in the making, and an identity for PUBLICS, a new curatorial agency and event space in Helsinki. To coincide with its opening, we’ll also hold a book launch for How Institutions Think, so if you are in Helsinki on the 9th of December, please come along!